Knubbens Gård är medlem i föreningen FIMS. Welcome to the farm that has ancestry since the 1500’s. The original building is currently for viewing in Skansen, an open-air museum in Stockholm. It is known there as “Bollnässtugan”, The Bollnäs Cottage. We are open from May until September. 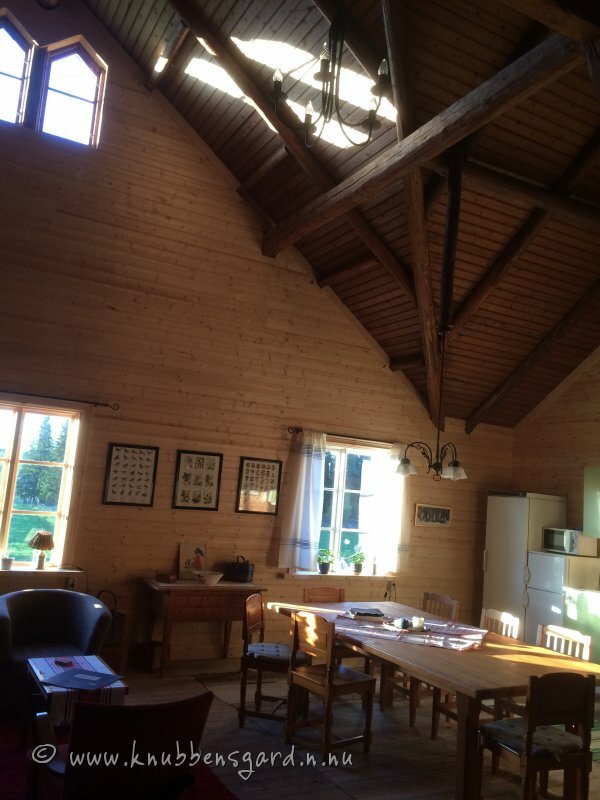 The accomandation is situated in the barn where the workers lived when it was still used as a farm. Since then we have made some renovations, but tried to keep the original feel. It consists of three rooms with 2-4 beds each. The first have a double bed and a bunk bed in an adjoining room. The second room have a double bed and a wonderful view. The third have two singelbeds. A common room with kitchen is for use to both accomodations. Downstairs you find the shared bathroom with a toilet and shower. Of course there is an outdoor privy for those open to the experience. On Knubbens Gård we speak Swedish, Norweigan, Danish, English, German and some French. For your access you have our boats, two plasticboats for 3-4 persons with a small motor. the are big enough to take you around Herten. 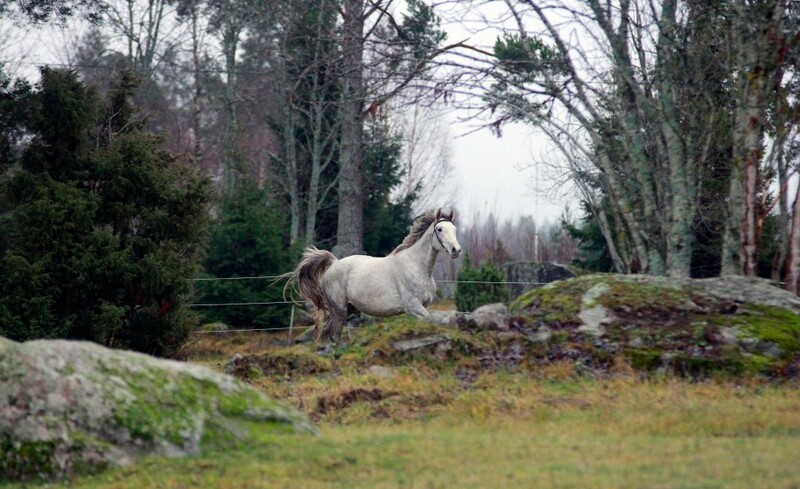 Our place is just 100 meters from the lake Nedre Herten with the depth of 18 m and 3,5 square kilometer big So you do not need a car, just walk throug the horsepastures. You can also in an easy way by boat go to Övre Herten 2,1 square kilometer and with a deep of 19 m. If you head the other way you end up in Östansjöviken. The lake is very varied and rich in nutrition where you will encounter large pike and a few big pikeperch. Really big perch is caught sometimes, the largest was 2.4 kg. It is suitable for all fishing techniques. The deeper parts of the lakes are best for trolling and the shallower areas and ledges are best for spin fishing. During the autumn large amounts of bait fish gather in a concentrated area which is a great place to hunt the big pikes. 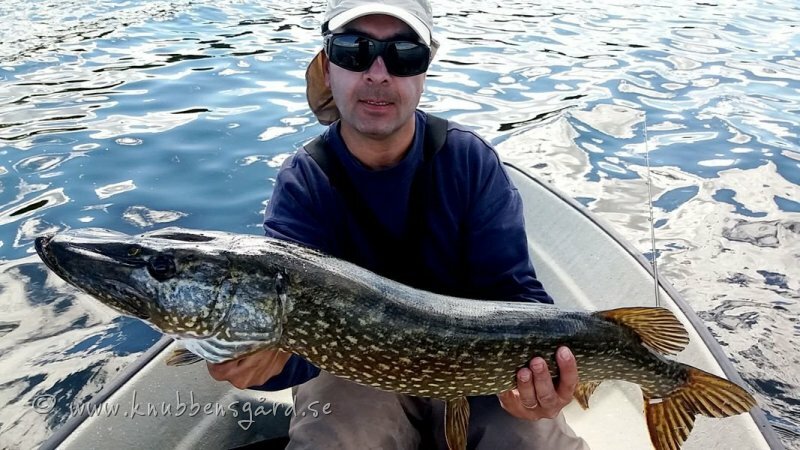 Pike fishing on the fly can be really good and well worth a try. 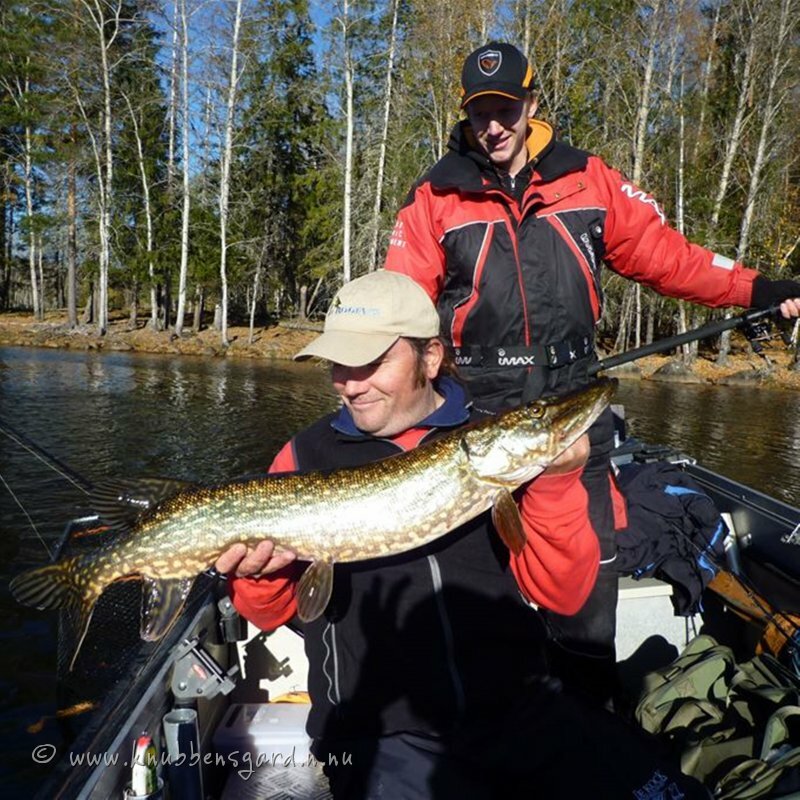 You can fish pike , perch and zander. The pikes have their home just around our bridge. We offer guided tours with our fishing guide Martin Elversson who can take you on fishing trips in his Buster aluminium boat, a 4.3 m boat for up to 3 passengers, with a 30 hp engine, double sonar and rod holders for trolling. If you want to go trolling on larger waters his bigger boat is available, an Örnvik 530HT, a hard top boat, 5.35 m long for up to 5 passengers, with a 75 hp engine fully equipped with downriggers, rod holders and sonar etc. You can also rent boats for your own trips. The Buster aluminium boat is available for rent as well as a smaller plastic boat which is around 3.6 m long equipped with a 4hp engine or a 44 lb electric engine. You can also purchase bait and other equipment directly from Martin. He will provide you with the bait in the right colours and appearance for the surrounding waters. Voxsjön is a lake in a tributary river to Ljusnan, called Voxnan. The lake holds large pike and a few small pikeperch. The fishing for perch is sometimes good. All fishing techniques are suitable. 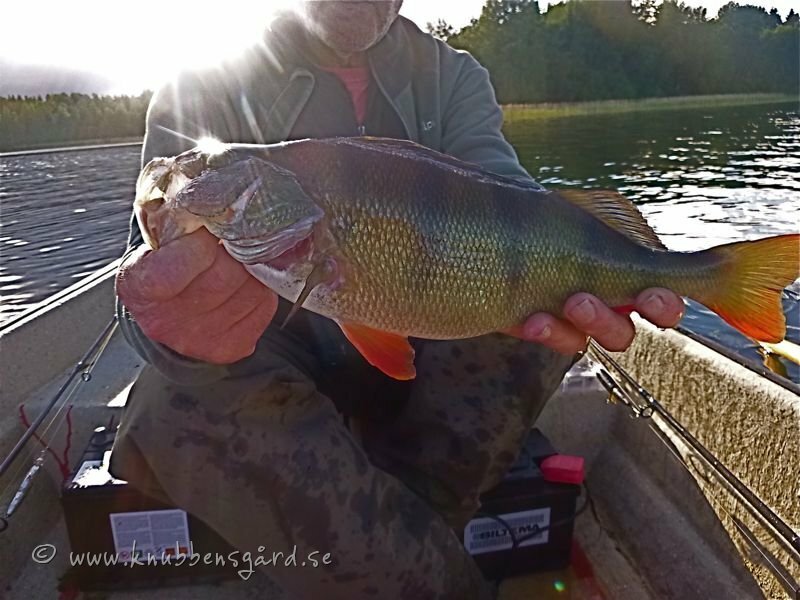 The season is all year round for pike and spring, summer and autumn for pikeperch and perch. The upper part of the lake is very scenic with some great places for big pike. We use many different fishing tactics depending on the species and season. During the winter season we fish for pike with baitfish. Zander fishing with baitfish from the ice is a challenging method and is also a possibility. 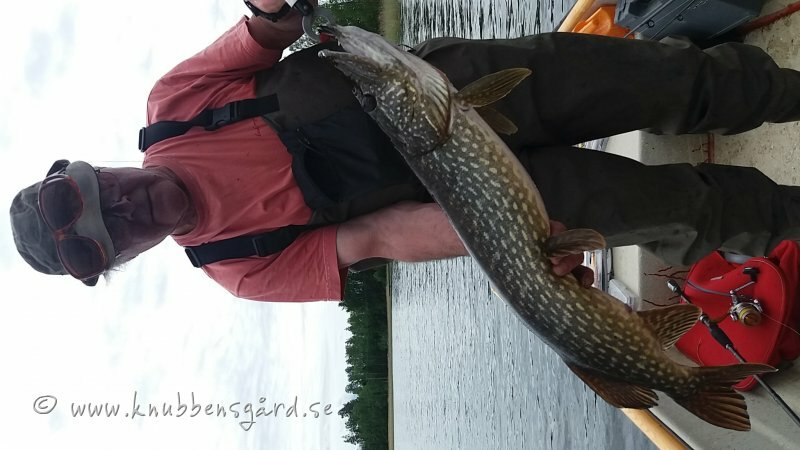 From spring until early summer we hunt the large pikes using spinning and trolling. During the mid-summer we give the pikes a rest and focus on perch with spin fishing or slow trolling with baitfish which are really effective methods! When the waters cool down again in late summer we start to focus on pike fishing again until the winter comes. During the winter season, spinning and trolling is very effective, and if you wish to go for the larger fish you should try fishing with baitfish. Zander fishing with a vertical jig or trolling are possibilities throughout the ice-free season. A personal fishing license is required to fish in the fishing waters in the surrounding area. We can provide you with the license you need for the fishing you wish to do. Catch & Release (C&R) is a method we employ, almost to 100%. If you are interested in taking home a few fish to cook and eat, this is permitted, but most of the fish caught should be released back into the water. The suroundings provides not just fishing. You can go golfing nearby at Bollnäs Golfklubb, take a stroll in the city center of Bollnäs for some shopping. Take a trip to Orbaden, there is an adventureplace with Zip-lines, downhill biking, climbing and a skywalk. You can also enjoy their spa or the nearby beach. Or take a page out of our book, just lie on your back, look at the newborn foales or lambs with a straw in your mouth and feel the time pass. There is also a possibility to go horseback riding. We raise sporthorses and also breed sheep. Hälsingland is well known for culture in many ways. Wordheritages in form of old houses with lovely indoorpaintings, you can visit during summer season. Gorgeous mountains with deep forests known through Sweden for their tranquility is around the corner. The common room with kitchen with a lot of air.